I have a confession. My favorite berry is blueberries - yet, I haven't bought fresh blueberries in months. I love winter, but I hate the high price of produce...so I try to shop seasonally, no matter how much I may crave the tart flavor of my favorite blue fruit. As spring gets closer, though, so are cheap berries. And when I saw that this coming Saturday is National Blueberry Pie day (who knew that was a thing!?! ), I couldn't resist finally sharing my recipe for a blue (purple?) smoothie bowl that tastes like dessert, but is healthy enough to eat for breakfast. And, not to toot my own horn, but I'd say this is one of the prettier healthy smoothies out on the blogosphere too! Just picture this: a deep purple blueberry shake, thick and creamy thanks to frozen fruit and zucchini, and sweet with a hint of tartness. Add some extra berries on top, crunchy granola and chewy dried fruit, and you're eating the Spring-iest "ice cream" you've ever tasted! Optional: a small handful of leafy greens. For the brightest purple-ish color, leave the greens out this time or use sparingly! Now, load up your blender, putting the fresh ingredients on the bottom and the frozen on top (for upright blenders like the Vitamix). If you have a less powerful blender or like a more drinkable smoothie, you'll want to add more liquid. You can also swap out frozen ingredients for fresh: the smoothie just won't be as thick and cold. Next, pour your blueberry shake in your bowl (or cup) or choice and let it chill (pun intended) in the freezer as you gather your toppings. You can choose whatever toppings meet your fancy. However, for a blueberry-pie-esque feel, add some crunchy elements like homemade granola, cereal (I love this puffed rice), trail mix (I prefer Enjoy Life Foods' or my personalized mix from Nuts.com), broken up protein bars (I bet a blueberry bar would taste InSaNe!! ), etc. I also like to add some fresh berries for some extra natural sweetness and dried fruit for a chewy texture. And, of course, no smoothie bowl is complete without nut butter! If you need even more topping ideas, check out my post here. I've even used leftover pieces of a mug cake or mini pancakes on my smoothies, so there's really no wrong choice. My favorite part about having a healthy smoothie bowl for breakfast is being able to start my day on a sweet note - but get plenty of nutrition too. For instance, blueberries offer high levels of fiber, Vitamin C and K and Manganese; bananas have been shown to improve heart health, aid digestion and serve as excellent pre or post-workout fuel; and the zucchini comes with plenty of Vitamin C, B and potassium (despite being low in carbs, calories and sugar). Add the healthy fat and vegan protein from granola, chia seeds and nut butter, and you have one deliciously well-rounded breakfast! I'll always be a berry lover, and I'll always celebrate when temperates start rising and berry prices start falling. 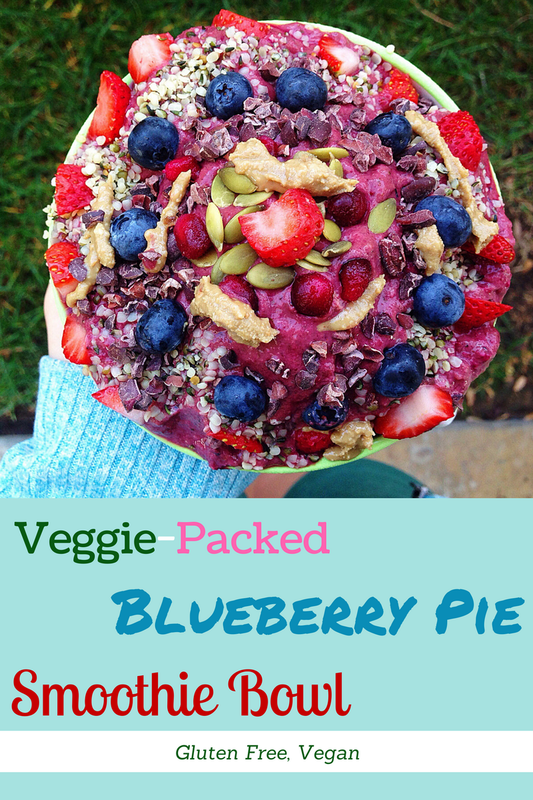 Thanks to this Blueberry Pie Smoothie Bowl, though, I have a feeling that this year's celebration will be especially delicious. What's your favorite fruit? Do you try to shop seasonally? What would you top this smoothie bowl with? I want to try this!!! Great way to get in some extra vitamins and minerals! Thanks Laurel. Hope you love it! That looks amazing! The colors pop, and my son would love this. We'll have to try it soon! National Blueberry Pie Day? Oh boy - I may just have to make myself a pie so that I can celebrate accordingly ;) This smoothie bowl looks and sounds amazing girl! Love all the nutrients you've packed in there. RIGHT?!? One of the BEST holidays ever, for sure! thanks for hosting such an awesome link-up! This looks great! I have never put zucchini in a smoothie! I'll have to try it! Such a great way to add some hidden veggies (you won't even taste it) and make a smoothie with a creamy thick texture! Blueberries are my favorite too. Definitely going to try this! Thanks for sharing! Thanks for the kind comment, Amy! This looks Ah-mazing! We are trying to eat more healthy foods and this smoothie bowl looks perfect for breakfast. I hate breakfast and never know what to make. Thanks! I can't wait to get some blueberries and try this! How beautiful! You eat with your eyes first and this certainly got my attention! this looks so good! thanks for sharing, cannot wait to try this! It's definitely one of my favorite smoothie bowls ever!